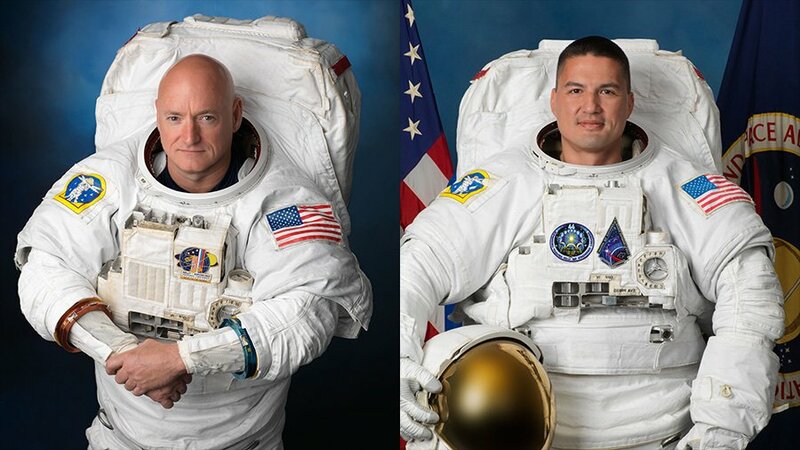 Astronauts Kjell Lindgren and Scott Kelly ventured outside the hatches of the International Space Station on Friday, completing their second in a pair of spacewalks. 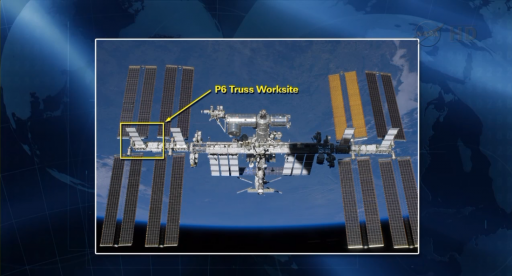 The crew spent 7 hours and 48 minutes outside, reconfiguring the Space Station’s cooling system on the outermost truss segment to return the system to its original configuration, essentially reversing work done in a 2012 spacewalk. The spacewalkers were facing a number of issues primarily focused on the liquid quick disconnects that were very stubborn and caused the crew to run out of time for the completion of all EVA objectives along with additional excitement caused by the Station’s attitude control system approaching its maximum capacity during the eventful spacewalk. Lindgren and Kelly completed their first career EVA on October 28, performing a number of maintenance and outfitting tasks on the exterior of the U.S. 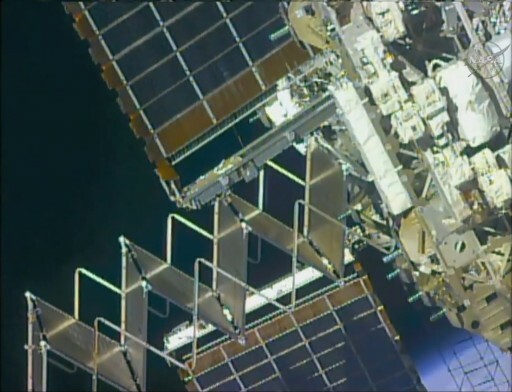 Segment of ISS. They installed a thermal blanket on the AMS-2 payload, the Station’s flagship dark matter hunter, they removed a cover from a degraded Main Bus Switching Unit for future repair and they lubricated the moving parts of the robotic arm’s end effector and laid down cables for the upcoming relocation of Pressurized Mating Adapter 3. Time-consuming work with the cables and the lubrication did not allow the crew to fully complete their task list, though the EVA is being classed as a success for the spacewalking duo. Getting ready for Friday’s spacewalk, Kjell Lindgren, this time acting as the lead spacewalker, and Scott Kelly, working as EV-2 for this spacewalk, spent some time studying procedures and using virtual reality trainers to look at their worksites. They also had specialized training sessions to get ready for working with the Fluid Quick Disconnects that are part of the Station’s cooling system and are known to have the potential of causing trouble. 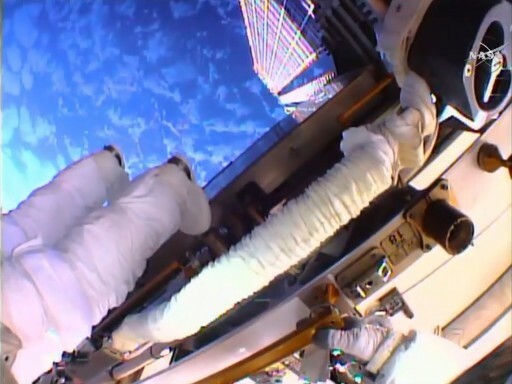 Getting up bright and early on Friday, the two spacewalkers along with Kimiya Yui and Sergei Volkov isolated themselves inside the Quest Airlock that had its cabin pressure reduced to allow Lindgren and Kelly to take off respirators providing them with 100% oxygen. The process of removing nitrogen from the blood of the astronauts is critical in the preparation for EVA in order to avoid them experiencing decompression sickness. When having ingressed their Extravehicular Mobility Units, the spacewalkers spent 100 minutes pre-breathing pure oxygen, 50 minutes were dedicated to light exercise to increase metabolic rates. 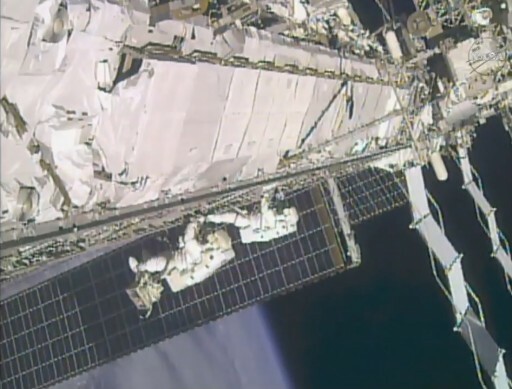 Thorough suit checks were conducted by both crew members to ensure their equipment was ready to support the spacewalk. Having their SAFER jetpacks installed on their suits, the crew members were moved into the smaller Crew Lock portion of Quest that was then isolated for the depressurization. Going through the methodical process of depressurizing the airlock, the crew performed a suit leak check before venting down pressure all the way to the vacuum of space, also verifying their tethers were in the correct configuration before opening up the hatch. The team worked ahead of their timeline throughout the morning to be able to get out of the hatch early and take pressure of the day’s overall schedule. The EVA officially began when the two spacewalkers switched their suits to battery power which came at 11:22 UTC, marking the start of a planned six-and-a-half-hour excursion. After the reconfiguration of their suits, Kjell Lindgren climbed out of the airlock followed a short time later by Scott Kelly. The two configured their tethers and went through the standard checks of their suits, cameras and tools before getting started with their spacewalk tasks. 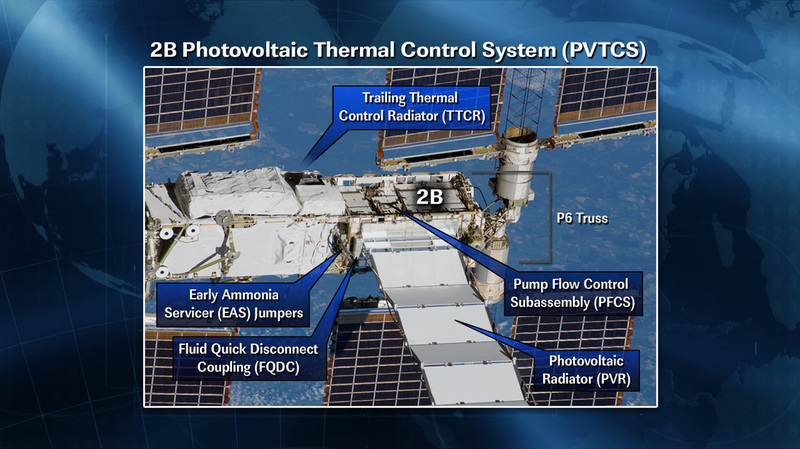 The objective of U.S. EVA-33 was the return of the P6 Photovoltaic Thermal Control System PVTCS 2B channel to a nominal configuration. The eight individual Power Channels of the International Space Station are cooled by the Photovoltaic Thermal Control System (PVTCS) that circulates ammonia through Photovoltaic Radiators (PVRs) to dissipate excess heat generated by solar power generation in the Solar Array Wings and keep the EPS (Electrical Power System) at a stable temperature. There are four PVRs on ISS, one on each Truss Segment that features Solar Array Wings. This particular cooling channel had been involved in a story of leaks and troubleshooting since 2006. Initially leaking at a very slow rate of just 0.7 Kilograms per year, the system only lost a small amount of ammonia coolant and required a top-off every few years. The leak rate rose considerably in 2012 and spacewalkers Suni Williams and Aki Hoshide completed an extensive troubleshooting operation – deploying an older radiator that was part of the Station’s Early External Thermal Control System and bypassed the P6 radiator so that the 2B channel was running its ammonia through the older radiator, thus bypassing any leaks suspected in the radiator area which is known to be susceptible to debris and micrometeoroid hits. Another rise in leak rate occurred in May 2013 when the system lost almost all of its coolant in a matter of hours and had to be shut down. 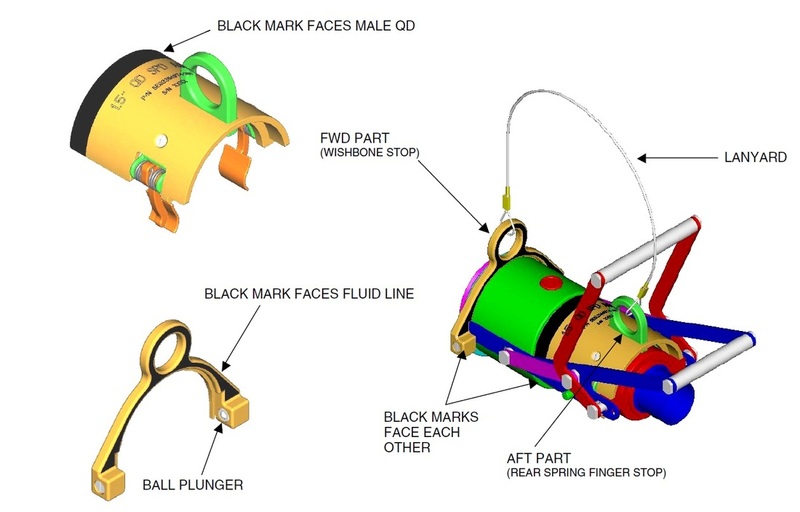 In response, Chris Cassidy and Tom Marshburn conducted an EVA to replace a Pump Flow Control Subassembly which had been confirmed to be the source of the leak. 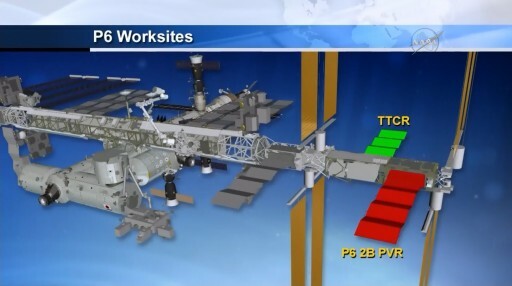 After the 2013 EVA, no more leakage was seen in the cooling loop and Mission Control began formulating plans to return to a nominal configuration of the P6 system with all coolant of the 4B and 2B PVTCS channels running through the P6 Photovoltaic Radiator. The task for Kjell Lindgren and Scott Kelly was to reverse the bypass configuration, stow the Trailing Thermal Control Radiator and complete a re-fill of ammonia on both systems, the 2B PVTCS and the Early External Thermal Control System. With a busy set of tasks lined up for them, the crew began their work – Kjell Lindgren retrieved a tool bag from the airlock containing the Vent Tool needed later in the EVA while Scott Kelly configured his tether and closed the airlock thermal cover. Next for the crew was the long translation to the port truss, all the way to the outermost segment of the Station’s 109-meter long truss structure. When arriving at P6, the crew made quick work getting set up, stowing tool bags and entering a good position for their first task, the reconfiguration of the Fluid Quick Disconnect Coupling (FQDC) that provides isolation capability of the Photovoltaic Radiators. 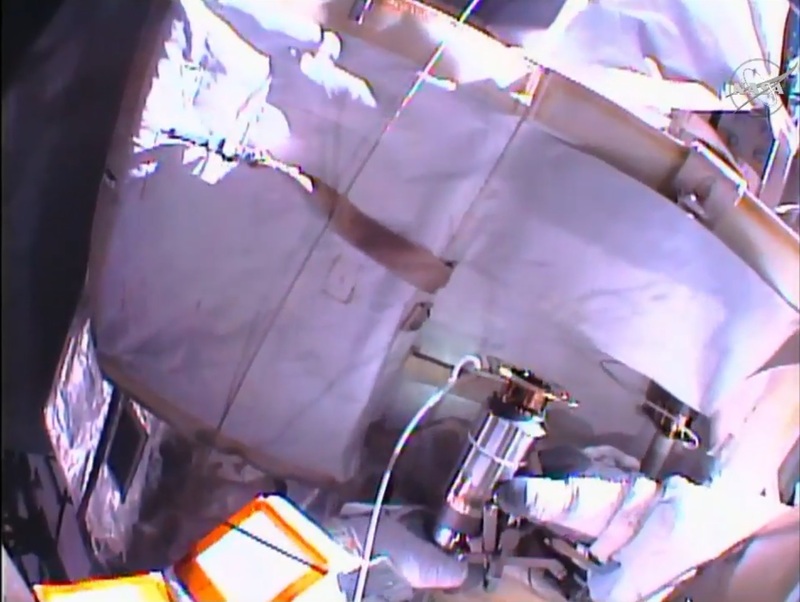 The spacewalking duo used a Pistol Grip Tool to release four bolts holding in place a cover over the FQDC. They switched the PGT back and forth to take advantage of their different positions to access the four bolts. Once the cover was removed, the crew could access the two FQDCs hidden underneath, one for the 2B channel, the other for the 4B channel. Leaving the 4B side alone, Kjell Lindgren used the Pistol Grip Tool to make 7 turns on the zenith FQDC bolt to re-open the isolation valve and allow ammonia to flow from the 2B PVTCS channel into the P6 Photovoltaic Radiator. No issues were encountered and the crew made quick work to re-install the cover with all four bolts loaded with a specific torque. Having completed their first task, the crew parted ways – Kjell Lindgren remained at P6 to get started with the reconfiguration of the ammonia Quick Disconnects while Scott Kelly made his way inboard to prepare the ammonia feedline for the re-fill of the system. Getting started at the Early Ammonia Servicing Jumpers, Kjell Lindgren began by removing two Subject Positioning Devices from the Quick Disconnects of the FH-01 and FH-02 ammonia jumpers plugged into the M2 and M1 locations on the Fill & Drain Box. He had some initial trouble getting the Subject Positioning Devices removed which are put in place to prevent the QDs from inadvertently opening. After a few attempts and some wiggling, he was able to remove the SPDs and work with the ground team to close both of the valves. Next for him was the removal of a protective cap on the M3 interface so that he could mate the line formerly connected to M1 to M3. When the M1 Quick Disconnect was demated, Lindgren noted a small ammonia leakage of a few flakes per second. After talking about the situation, Mission Control advised him to go through the motions of connecting that QD back to M1 and then repeat the valve closure and QD removal with the hope of getting a good valve seal without leakage. 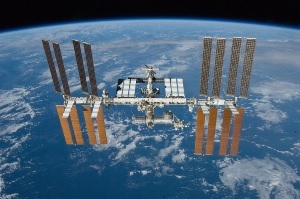 The Fluid Quick Disconnects on ISS have shown an inconsistent behavior in recent years as some cooperate when being mated/demated and others give teams plenty of trouble which appeared to be the case on Friday. 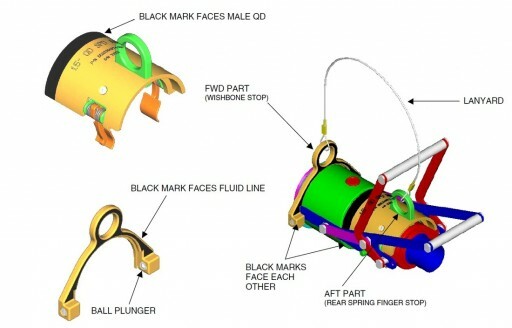 After re-removing the jumper from M1, Lindgren reported the same leak rate but was given a GO to press ahead and attach a cap to M1 and install the Quick Disconnect to M3. The installation was without issue and the Fill & Drain Panel was left with M2 and M3 connected to the Jumpers to the Long Spacer, but with valves in both jumpers closed. Working at the P3/P4 interface, Scott Kelly had the task of retrieving an ammonia jumper and connect it to interfaces on P3 and P4 in order to bridge a gap that is left in the ammonia feed line to permit rotation of the Solar Alpha Rotary Joint. 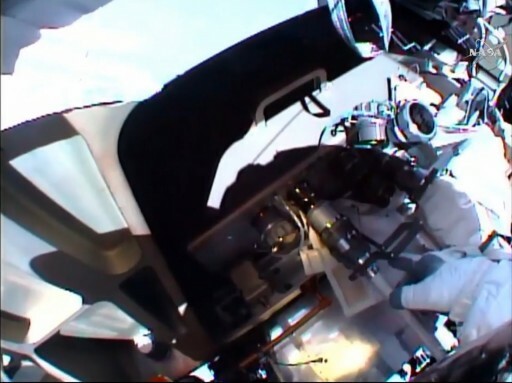 Working on the P3 side of the interface, Kelly had to do the Quick Disconnect installation twice after his first attempt did not pass the pull test used to verify the QD is firmly in place. He had less trouble with the second Quick Disconnect and was able to report that the jumper was in place. Kelly then continued his translation inboard to P1 where the Ammonia Tank Assemblies are located. There, he switched a jumper from the vent position to the fill position going through the standard Quick Disconnect demate and mate procedures, this time with no trouble. In the meantime, Kjell Lindgren set up a Vent Tool and Vent Tool Extender, essentially a nozzle that can be positioned to vent any residual ammonia overboard in a chosen direction. He secured the nozzle and connected it to the extender to interface with the ammonia line to permit ammonia to be vented outboard on P6 once the re-fill was complete. Getting set to top-up the P6 ammonia systems, Mission Control commanded the Ammonia Tank Assembly Vent Valve to open and with that, allow ammonia into the feed line all the way to the P5 truss segment. Scott Kelly was standing by at the M1 jumper to close its valve in case of an unexpected ammonia leak. The line pressurized and showed good integrity, not requiring a rapid closure of the valve. Working on the outboard truss, Kjell Lindgren removed the F14 Quick Disconnect from a dummy plate and connected it to the ammonia feed line so that ammonia could flow from the tank assembly through the feed line and into the P6 Early External Thermal Control System. Lindgren went back to the Early Ammonia Servicer Valves he had worked on earlier to open up the valves to the PVTCS and mark the start of ammonia flow into the 2B channel of the system. The fill was 20 minutes in duration to permit 6.5 Kilograms of ammonia to flow into the P6 PVTCS and EETCS. 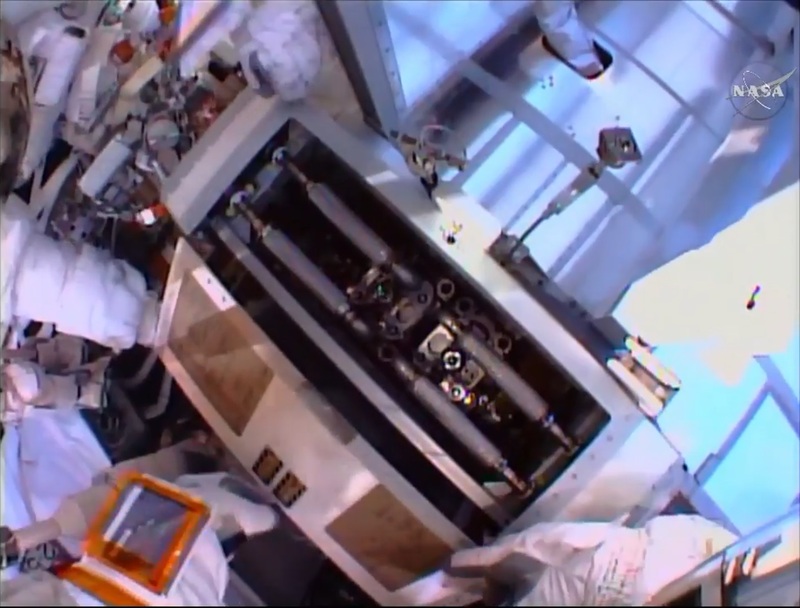 With good ammonia flow confirmed, Kelly and Lindgren worked on separate tasks. Kelly translated over to the CETA equipment cart on the starboard side of the truss segment to reconfigure its brake handles and remove two components. Tying down the handles with a Long-Duration Tie-Down Tether ensures that they will be out of the way and allow the Station’s Mobile Transporter to access its Work Site #1 location. With the handles secure, Kelly removed the CETA Cart Coupler by releasing two PIP pins and attached it to the CETA swingarm with a locking knob and a wire tie. Next, he tethered himself to the swingarm and removed it from the CETA Cart to move it over to a stowage location. Out on the port truss, Kjell Lindgren translated from the forward face to the zenith-aft location for a survey of the TTCR, Trailing Thermal Control Radiator, in order to ensure no hardware was in the way for the retraction of the radiator. Mission Controllers put in place the necessary inhibits and reconfigurations and provided a GO to Lindgren to begin driving a retraction bolt 49 turns to fold up the TTCR in its stowed position. It took just 2.5 minutes for the segments of the radiator to fold up in an accordion-like fashion. By that point, the EVA had been running one hour behind the timeline and teams were looking closely at consumables to decide how to proceed. 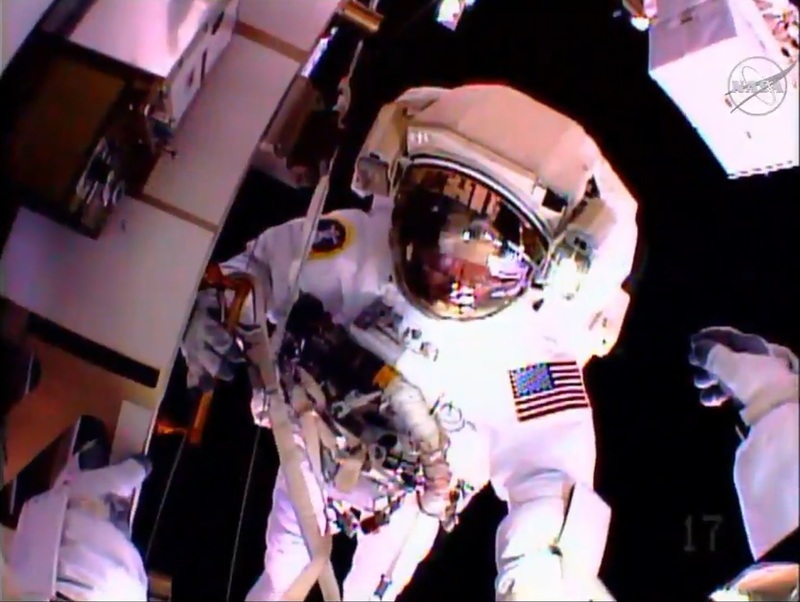 Regardless of their EVA time, the spacewalkers had to continue to complete the ammonia line vent and remove and reconfigure the jumpers that had been touched earlier. 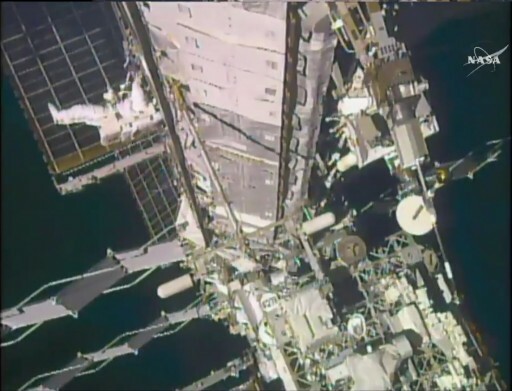 Moving out from the inboard direction, Scott Kelly made a stop by the port Solar Alpha Rotary Joint where he secured a series of struts that, as indicated by telemetry, had come loose and started vibrating. Forgoing the last of the struts, Kelly was ordered to move out to P5/P6 to help with the setup for the vent of the ammonia line as Kjell Lindgren was again held up by the Quick Disconnects at the Early Ammonia Servicer. 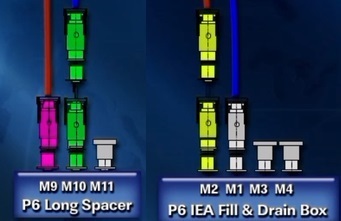 Originally, Lindgren was expected to remove a cap on the M4 connector and mate the M2 connector to it, but when releasing the cap, he reported ammonia flakes coming from M4. Mission Control told him to re-attach the M4 cap and demate M2 for it to be tied down. Running into trouble, Lindgren needed several attempts to demate the stubborn M2 QD. Once demated, M2 had a cap installed and was tied down next to M4, marking the completion of work on the dreaded EAS Quick Disconnects. Kelly and Lindgren then worked together to finish the setup of the Vent Tool that had also not been very cooperative as the spacewalkers fought the stiffness of the hose. When the setup was complete, Kelly moved out of the way and Lindgren opened up the valve and also departed the worksite rather swiftly to avoid a contamination of his suit by the escaping ammonia. 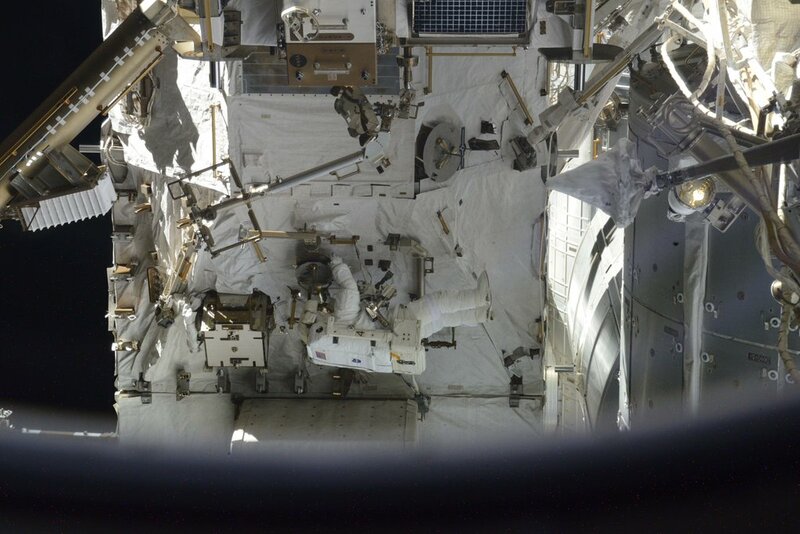 The valve was left open for 17 minutes, allowing the crew time for an inspection of their suits and a short break. Getting back to work, Kjell Lindgren moved outboard to P6 where he demated the F14 QD from the Vent Tool, installed the connector on its M14 dummy panel, and collected the Vent Tool that was placed back in its bag. 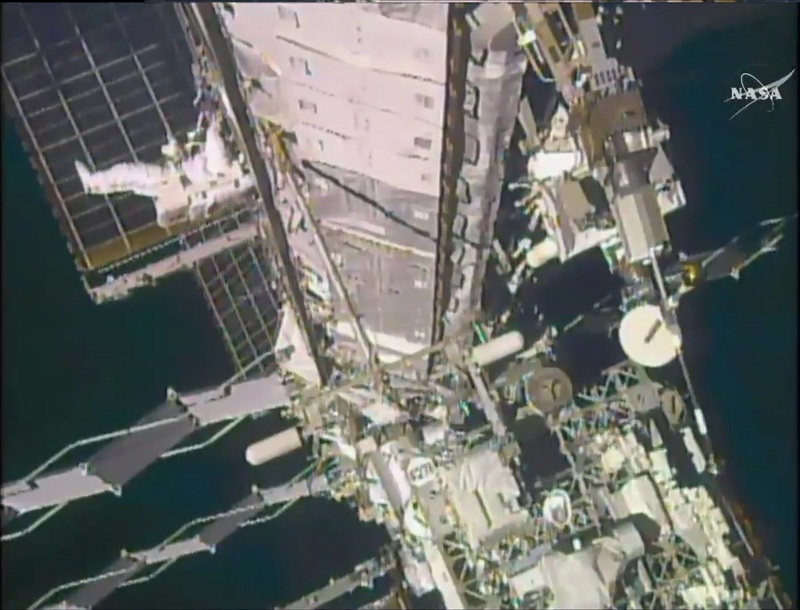 Scott Kelly reversed work he had done earlier, removing the P3/P4 jumper and stowing it nearby to allow the Solar Alpha Rotary Joint to resume motion after the EVA. In the midst of their work, another pressing issue was approaching as the Station’s Control Moment Gyros were closing in on saturation. Desaturation firings of the thrusters are generally avoided during EVAs and the current state of the TTCR dictated, per the flight rules, that no thruster firings could take place as long as the TTCR was not cinched down or fully deployed. Mission Control decided to re-deploy the TTCR given the CMG were saturated and the crew was almost out of EVA time. While Kjell Lindgren was getting started to drive the TTCR bolt, ISS started drifting out of its working attitude and Kimiya Yui was instructed to prepare for a loss of communications scenario in case the CMGs would remain saturated. As soon as Lindgren reported that the TTCR was fully extended, the Attitude Control System was commanded to enable assistance from the Russian thrusters to desaturate the CMGs which was successful, allowing the crew to proceed in a nominal fashion and close out the EVA in order. The final task for the crew was the retrieval of the Vent Tool and its stowage on the airlock, done by Kjell Lindgren and the reconfiguration of the Ammonia Tank Assembly jumper from a fill to the vent position, completed by Scott Kelly. Calling it a day with only a few open tasks left, the crew was able to look back at a very challenging spacewalk highlighted by quite a few pieces of stubborn hardware. Heading back to the airlock, the spacewalkers went through the usual checks of their suits and tethers, also completing an inventory of tools and equipment before heading back into the airlock. Scott Kelly was first to ingress Quest followed by Kjell Lindgren who closed out the final tether configuration. Once back inside, the crew connected their suit umbilicals and switched to ISS power and cooling. After the usual two-minute wait following sublimator deactivation, Kjell Lindgren closed the hatch and Kimiya Yui greeted the crew to walk them through the repress procedure. 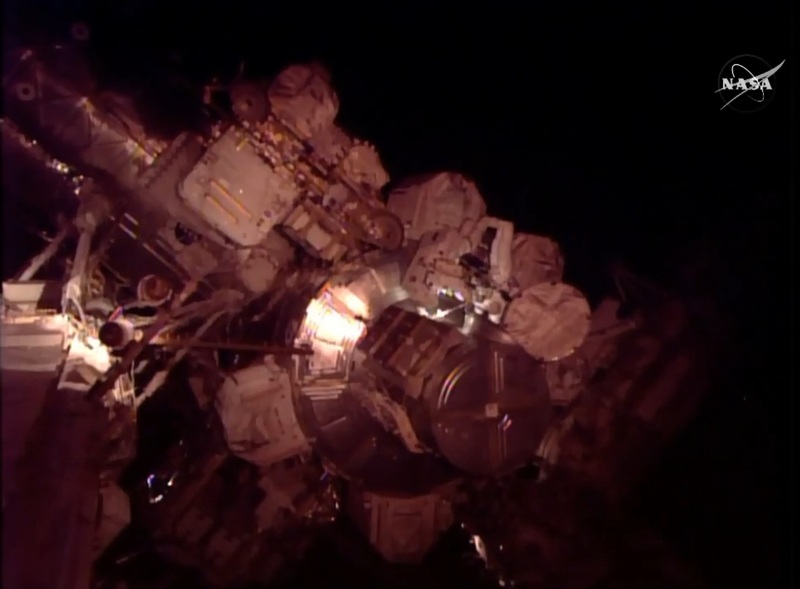 Airlock repressurization was initiated at 19:10 UTC, bringing this EVA to a close after seven hours and 48 minutes. Friday’s spacewalk was the 1,190th in support of ISS Assembly and Maintenance for a total time of 1,192 hours. For Kelly and Lindgren their EVA total now stands at 15 hours and 4 minutes, looking back at two rather challenging EVAs that did not achieve all objectives but left ISS in a better position than before. 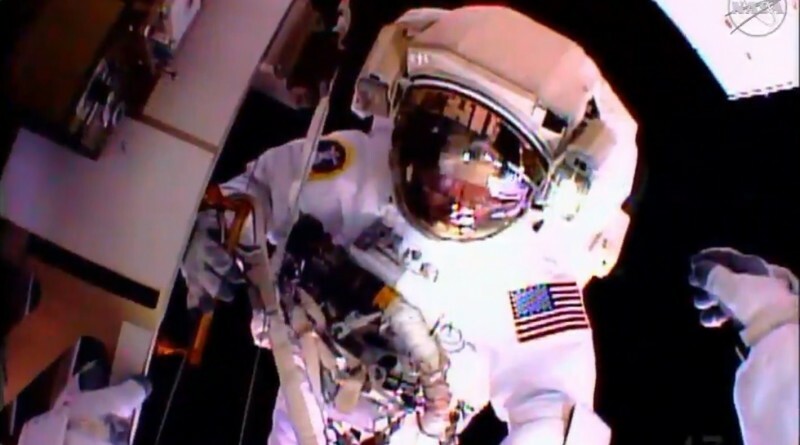 U.S. EVA-33 was the final planned spacewalk of 2015. Expedition 45 is now looking forward to a shift in focus as a number of cargo missions are lined up for December and the early weeks of 2016 along with a direct handover between Soyuz crews prior to the holidays.